This page is about the Soviet Lend Lease Matilda. The British Matilda can be found here. Der Matilda IV ist ein sowjetischer premium mittlerer Panzer der Stufe 5. Ein britischer Panzer, der im Rahmen des Leih-und-Pacht-Gesetzes an die UdSSR geliefert wurde. Dezember 1941 wurde ein Matilda mit dem sowjetischen 76,2-mm-Geschütz ZiS-5 und dem Maschinengewehr DT ausgerüstet. Die bessere Durchschlagskraft und die Möglichkeit, Sprenggranaten zu verwenden, steigerte die Feuerkraft deutlich. Es gibt keine genauen Daten über eine großangelegte Umrüstung des Fahrzeugs. 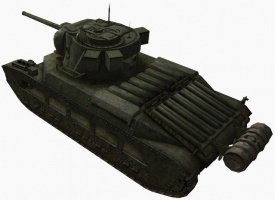 Though the Matilda IV is classified as a medium tank, when compared to similar-tiered vehicles it emerges about equal in terms of firepower and armor, but its low mobility lends this tank to be played more as a heavy tank, specifically a tiny stock KV-1. The Matilda IV is more like a heavy tank than a medium tank in playstyle. Like any other slow tank, it requires careful analysis of the enemy team composition and map layout in order to be able to ensure that it arrives in time to make a difference in the battle. The 76 mm ZiS-96 has a phenomenally good aim time by Soviet standards, and has the rate-of-fire to make up for any shots that may have bounced or missed. Its primary failing is the low penetration, especially by the standards of Tier 5. The gun is nearly the same thing as the 76 mm ZiS-5 (the KV-1's stock gun) or the 76 mm F-34 (the T-34's intermediate 76 mm gun), and even with APCR, it will have a very difficult time penetrating most heavy tanks. The accuracy is also fairly disappointing, making long range shots and targeting weakspots in heavily armored tanks somewhat tricky. The ammunition capacity is also somewhat limited, given the high rate-of-fire, so shots must be taken with care. The Matilda IV boasts good armor for a medium tank, and this combined with its excellent gun depression (one of the best in the game) makes it very good at fighting on hilly terrain. Many lower tier tanks will have significant trouble penetrating it from most angles, but equal and higher tier tanks, especially heavy tanks and medium tanks armed with howitzers, will have very little trouble penetrating its armor It is also very important to avoid open areas and stay artillery-safe, because even though the Matilda IV does not take too much damage from lower tier artillery, they are still capable of wearing it down with repeated hits. The role in which the Matilda IV excels is that of flank protection. 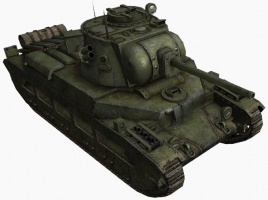 It will have absolutely no problems destroying any light tank and most medium tanks that it faces, and it has the HP to take a few hits. 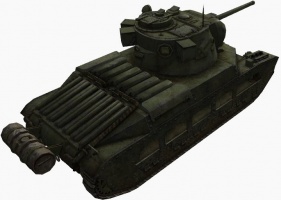 This makes it ideal for protecting allied heavy tanks from lower tier tanks and medium tanks, allowing the heavy tanks to focus on tougher targets. With the good HP, armor, and slow speed, it may be tempting to play like a heavy tank, but in that role the Matilda IV is very outclassed. In short, stick to side alleys, flanking passages, and allow your low pen but fast firing gun to take threatening mediums and light tanks out of harm's way of your team. As a premium tank, the Matilda IV does not have any modules to be researched. 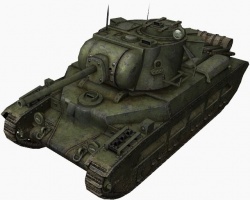 The Soviets began receiving the Matilda infantry tank from the British via Lend-Lease in 1941, following the German invasion in June of that year. While they liked the thick armor, they were highly dissatisfied with the Matilda's low mobility, and especially its Ordnance QF 2-pounder gun, which not only had inadequate penetration but also lacked a useful high explosive round. In order to at least address the armament problem, the GAU (Glavnoye Artilleriskoye Upravleniye - Main Artillery Directorate) began a project in November 1941 to rearm the Matilda with the 76 mm ZiS-5 that also armed the indigenous KV-1 heavy tank. 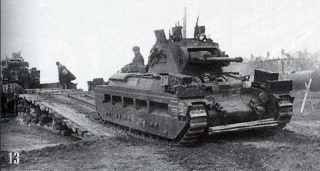 One Matilda Mk. 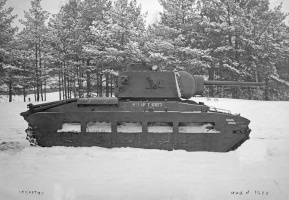 III was thus modified in December 1941, essentially by removing the complete gun and gun mantlet assembly associated with the 2-pounder gun, and welding in place the gun and gun mantlet assembly of the KV-1. 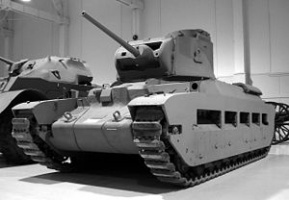 The modified Matilda underwent trials that same month, but development was cancelled in January 1942, primarily due to conflict between the GAU and the GABTU (Glavnoye AvtoBronetankovoye Upravleniye - Main Automobile and Tank Directorate), the body primarily responsible for Soviet tank development. The arrival of Matilda CS tanks under Lend-Lease that same year, which were armed 3-inch howitzers with adequate high explosive ammunition, and the increasing production of Soviet T-34 and KV-1 tanks also made the project superfluous. 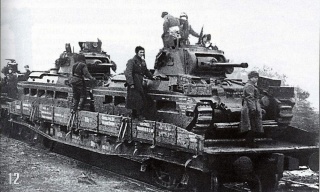 Soviet Matildas being transported to the frontlines, about April 1942. 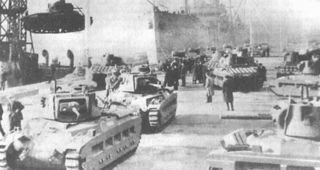 Soviet Matildas being off loaded in the Soviet port of Arkhangelsk (Archangel), about February 1942. Diese Seite wurde zuletzt am 25. Oktober 2016 um 13:55 Uhr geändert.